Hair loss in both men and women is experienced at some point in their lives. It is a harsh truth but unavoidable. Yes, you heard us! Firstly, know that there are three cycles of hair growth: (1) growing (80% of follicles), (2) resting, and (3) shedding. In human hair, each follicle cycles at its own individual rate, where these cycles change with the season, and all hairs are in the same part of the cycle at the same time. 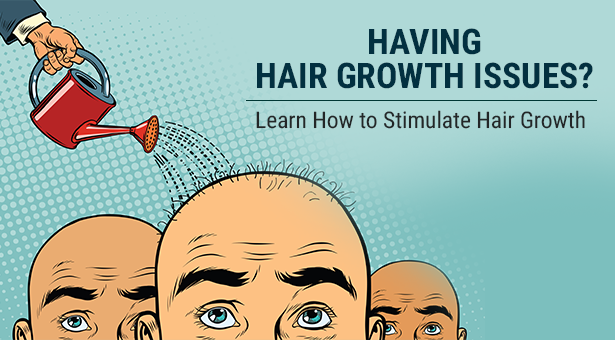 Each person sheds hair and regrows hair every day? Hair loss is thought to affect around 70% of men and 40% of women! Our scalp sheds approximately 100 hairs per day normally. The most common cause of the Hair loss or baldness is a genetic trait. No-one likes admitting that they are suffering from hair loss unless going bald is your style. But the sooner you decide to do something about it, the more your hair will benefit. There are some simple everyday actions you can take to stimulate hair growth and prevent hair loss. A healthy hair growth relies upon a daily dose of vitamins, minerals, and protein. These dietary A-listers will only do their job if your blood circulation is good which means regular exercise to keep the body in tip-top condition. It is also important to minimise consumption of alcohol (which makes hair dry and brittle and more prone to breakage) and cigarettes (the toxins slow hair growth). Finally, keeping stress levels low will help the hair stay shiny and healthy. Hair texture can undergo serious damage from over styling. Straightening hair, wearing wigs, extensions, tight ponytails, braids and weaves all place extreme tension on the hair shaft and can lead to a hair loss condition called Traction Alopecia. Chemicals found in hair dyes and relaxants can also cause damage. Be extra careful not to burn your scalp when using these products as hair follicles that are burnt cannot function properly and the hair will not regrow. Excessive heat (hair dryers, straighteners) can also cause the hair to become dry and brittle and more prone to breakage. This can be avoided by using a heat-protective spray. Stimulation is a key to hair growth. First, you want to make sure that your scalp is regularly exfoliated. You can do this by oiling or brushing your hair with a soft bristle brush daily or weekly with a formulated scalp treatment. Either way, this will prevent your hair follicles from being blocked by oil, debris or dead skin cells. Take steps to prevent hair loss and improve hair growth from the inside out by adding certain vitamins and minerals to your diet. Vitamin C fights off the free radicals that create brittle hair and cause damage to hair follicles. Even better, vitamin C increases collagen production in the body, which improves hair health. Vitamin B5 can also help increase hair growth by rebuilding individual hair shafts which are often damaged by blow-dryers or heated hair tools, by shampooing too often or by sun exposure. Vitamin H is also known to improve hair quality at the follicle level and can help strengthen individual hair shafts. As a result of genetics, a majority of men and over half of women will suffer from the effects of Dihydrotestosterone (DHT) which attacks the hair follicles causing hair growth to slow and eventually stop. Men will often begin to see the early signs of Male Pattern Baldness in their 20s or 30s and it usually starts with a receding hairline and hair loss from the crown area. Female Pattern Hair Loss normally develops when a woman is in her 30s or 40s, with the thinning becoming more noticeable during the menopause. For some men and women, the condition can start earlier. The good news is that the condition can be successfully managed with hair loss treatments. The key to successful treatment is an early diagnosis and a tailored treatment programme. Skin City is India’s best Hair Transplant and aesthetic dermatology centre. We provide the highest quality of results at affordable cost at our exclusive centres across India, with the help of the highly trained team of doctors. A consultation with a Skin City hair loss specialist will provide you with a full computerized hair diagnosis of your condition and an individualized hair loss treatment plans. Appointments are available 7 days a week. To book yours, contact us at any of our clinics closest to you.